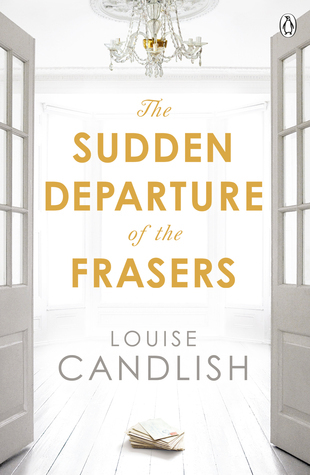 Earlier in the year, I read some good reviews of The Sudden Departure of the Frasers and put the book on my to read list where it has been making it’s way slowly to the top ever since. One of the downsides of having a never ending to read list is that, sometimes, you get to the book and you can’t remember why it made it on there and this was the case here I must admit. I couldn’t bring to mind one review, other than people liked the book. My own rule of not reading reviews right before I read a book in case it spoils it for me meant I pretty much picked it up blind then, not sure what to expect. In the end, I think this a good thing because I spent a lot of the book wondering just where it was going and I loved this. It made it a real page turner (or at least I would have been turning the pages if it hadn’t been on audiobook). The story starts with Christy feeling a sense of dread at opening the door to her new house. It might be because her husband has had to work and she is doing an important thing on her own. Or it might be because buying the house of their dreams has saddled them with a huge mortgage that means they will be eating value brand beans for the rest of their lives. And value brand beans do not fit with the street they’ve moved to, desirable Lime Park Road in the London suburbs, or the house itself, which is perfect in every way. Except Christy can’t shake the feeling something must be wrong because the previous owners – the Frasers – moved out after just over a year…and sold them the house at a discount price. This feeling is compounded when she starts getting the cold shoulder from all of her neighbours, with one – Rob – being rude to the point of aggression. Something, she is convinced, happened in her house and the Frasers are at the centre of it. Unable to let go, she starts asking uncomfortable questions and – if not quite stalking – as good as spying on the other residents. While Christy is in the dark, as the reader, you start to get clued in through alternate chapters told by the beautiful, glamorous, and enchanting Amber Fraser, a woman everyone seems to love and can be forgiven anything. Behind the perfect image, though, she isn’t quite what she seems. It’s interesting to see how her welcome to Lime Park Road was so very different to Christy’s but also how her behaviour is – ultimately- responsible for Christy’s situation. It’s also interesting to see how people’s response to money and good looks change their behaviours to the two women. The alternating chapters show this well and I started out feeling very sorry for Christy at the beginning. I also wondered just what type of sticky end Amber had come to. I couldn’t imagine it was anything good. Unfortunately by the end, I had lost that sympathy and was starting to get quite frustrated with Christy and how her obsession was stopping her live the rest of her life. I didn’t like Amber from almost page one, but I think that was the idea, showing the not so nice side of people. Throughout, Louise Candlish does such a good job of pacing the novel, keeping the tension going all the way through before presenting an ending that I found quite morally ambiguous. I think it’s hard to do this and always admire an author who leaves me with a question at the end. which means that, frustrations with Christy aside, I liked this book a lot and will be definitely be looking for more books by the author. Recommended read!